My good buddy Mark contacted me asking if I would be interested in doing a short story for Fat-Bike.com so here I am. Mark wanted the new version, not the one that has been told over and over. So where to start huh? Well really my riding began again back in 2008, not on Fat-bikes I have to say, at that point I hadn’t even heard of a Fat-bike. Nope, that wasn’t until later on while browsing the World Wide Web I came across this awesome looking titanium ride. Immediately, I thought “I got to get myself one of those”. The bike in question was a Sandman Fat-bike and it was so new that it hadn’t gone into general production. I contacted Sandman and rather cheekily asked “hey would you like to sponsor me on one of your sweet bikes”. Sandman were very polite and asked me to keep in touch, and roughly a year later my shiny new Sandman Hoggar Ti arrived from Belgium to right here in the UK. As Sandman was a new and bespoke company they couldn’t fully sponsor me though they did invite me on board as an ambassador for their bikes, something I was proud to do. Now, you may ask why this guy should get a deal on a bike. And that’s a fair question. I believed I had a unique angle and selling point, you see the reason I hadn’t begun riding again until 2008 was that I had had an above knee amputation and at the time of contacting Sandman Bikes I was very fortunate to be sponsored on an awesome sporting prosthetic knee called the Bartlett Tendon. Anyhoo that’s a brief history out the way. Mark asks, take a look at your Fat-bike life? I have to think about this…One of the major things anyone will notice about getting into Fat-biking is the community. Get yourself a Fat-bike and once your online and start talking to fellow Fat-bikers, well it’s just awesome. These people are like no other, yeah they maybe what some see as “Geeks” chatting about tyre pressures and all the latest gismo’s and kit. But as well as that they are some of the friendliest, most helpful people on the planet. I believe being a Fat-biker has also gave me the impetus to search for adventure. I know sounds weird, but hey I have always been a bit of a “home bird” yet last year I had my greatest adventure to date and travelled all the way to Ogden, Utah to ride with my awesome buddy, Mark Peterson. Someone I may never have met if it wasn’t for purchasing one of these unique machines. WoW! So after riding in the beautiful Ogden Mountains I guess when I came home I kind of took for granted my own general area and just how lucky I was. The thing about Fat-biking is each time I head out it’s like a whole new adventure. It doesn’t matter if it’s a simple urban jaunt, where I can make up my own playground, or a venture to our local coastal areas, playing in the light surf or even a ride in some of the beautiful woodland trails we have here a bouts. Oh and I forgot to mention those winter months when we do have snow. All those trails you know so well suddenly become like whole new area’s to explore and you can do it on a Fat-bike no problem. Fat-biking it’s a totally different experience to any other type of riding on any of my other bikes. Over here in the UK the whole Fat-biking scene is becoming increasingly popular, with regular Fat-bike meetings and festivals. We are now finding that what was once considered a flash in the pan that would fade out of existence in no time is being picked up by more and more main stream bicycle manufacturer’s as they compete to design their own style of Fat-bikes. So the 650B’s and the 29er’s may fade away, but Fat is most definitely here to stay. 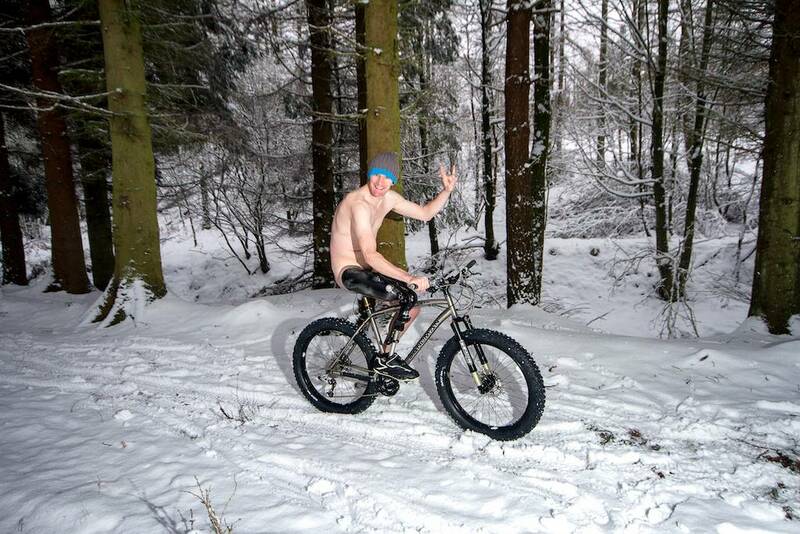 If I were to sum Fat-biking up in a few words it would be Fun, Community and most definitely Freedom. Freedom to invent your own adventures and always with a huge grin on your face no matter where you live. Thanks for the story, Glenn! We always love to hear that our community is really one big, happy family. Keep on, keeping’ on! Fantastic story- this is why I love fat-biking. Great people looking for adventure over speed. Glenn is an awesome person and a great Friend. I love him like a brother and my Family has unofficially adopted him. These are the kinds of friendships you never expect, but are the most valuable. Much Fat Love Bro!